Daily Illuminator: Tanks For Everything! 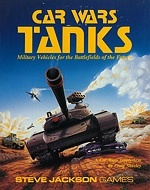 July 15, 2013: Tanks For Everything! Having trouble finding a parking space? You need a tank! With Car Wars Tanks -- newly released to e23 -- you'll have the ultimate high-tech edge on tomorrow's post-apocalyptic roads (or lack thereof). It comes with full details for building all manner of war machines -- from tiny personal carriers to giant supertanks -- plus rules for what happens when these titans clash. It also includes counters, plus maps of tank-suitable rocky terrain . . . use your new ride to make molehills out of mountains! With Car Wars Tanks, the roads are more dangerous than ever.